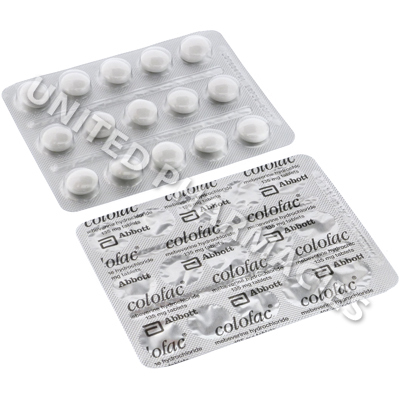 Colofac (Mebeverine Hydrochloride) is an antispasmodic medicine indicated for the treatment of used to treat patients with irritable bowel syndrome (IBS). It works by preventing muscle spasms in the digestive tract to stop diarrhoea, gastro-oesophageal reflux disease (GERD), or the frequent need to use the restroom. 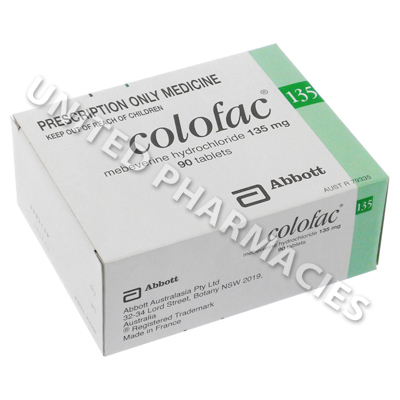 Colofac (Mebeverine Hydrochloride) is an antispasmodic medicine indicated for the treatment of used to treat patients with irritable bowel syndrome (IBS). It works by preventing muscle spasms in the digestive tract to stop diarrhoea, gastro-oesophageal reflux disease (GERD), or the frequent need to use the restroom. Your doctor may also recommend its use for the treatment of other unlisted conditions. Colofac (Mebeverine Hydrochloride) should always be used according to your physician's instructions to get the most effective results from treatment. Your individual instructions will depend on your age, weight, current health, the condition being treated, and the severity of your symptoms. These should be swallowed with a full cup of water and may be taken on an empty stomach, although a meal or snack is suggested before use if you experience nausea. Do not chew, split, or crush the tablets before use as this may destroy or change the effects of their contents. Ask your doctor or pharmacist any questions you have about the medicine to ensure the correct usage. Ensure that any side effects you experience are reported to your doctor. If you experience any serious side effects, you will need to visit your doctor or go to the hospital immediately. Always use Colofac (Mebeverine Hydrochloride) as you have been prescribed by your doctor. Never self-medicate or change your dosage without first consulting your doctor. The correct dosage can vary depending on your health, medical history, and the severity of the condition being treated.